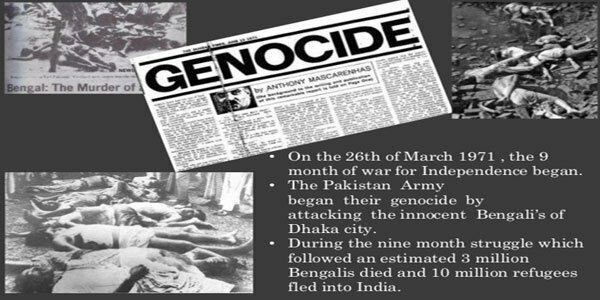 Dhaka – Bangladesh is set to observe March 25 as genocide day recalling the horror of attacks by the Pakistan occupation army killing hundreds of thousands of unarmed civilians in the then eastern wing of Pakistan on this day in 1971. A one-minute blackout from 9:00 pm to 9:01 pm will be staged across the country Sunday to remember those killed in the black night that followed an armed struggle Bangladesh began against the Pakistani forces. A junior minister said that he hoped the people across the country would put their lamps for a minute on that night for a minute. State Minister for Power, Energy and Mineral Resources Nasrul Hamid said power supply across the country would be normal to stage a complete blackout in memory of the victims of March 25 night, 1971. Director General of Power Cell Engineer Mohammad Hossain said the country’s electricity demand would be 3,000 mw less than the normal time, according to state-run Bangladesh Sangbad Sangstha news agency. The government on March March 11 decided to observe the nationwide blackout. The Jatiya Sangsad during its 14th session in 2017 unanimously adopted a resolution declaring March 25 as the Genocide Day. Father of the Nation Bangabandhu Sheikh Mujibur Rahman declared the Independence calling upon the people to build a united resistance against the Pakistani occupation forces just ahead of his arrest from his 32 Dhanmandi residence. Different political parties, socio-cultural organisations and proliberation forms have chalked out elaborate programmes in observance of the Black Night to pay deep homage to the martyrs.